AVALON—Harbormaster James “JJ” Poindexter received a Christmas miracle at the end of December 2018 when boaters heeded weather warnings. Mitchell, a 39-year-old harbor patrol assistant, was killed on duty in 2014 during a storm. While trying to save King Neptune, a diving vessel for ScubaLuv, Mitchell tried to jump ashore as the boat ran aground, pinning him between the boat and the harbor rocks. According to an article that ran in Los Angeles Times in 2015, Mitchell was a recent U.S. citizen via New Zealand, had been a dive instructor on Catalina for 10 years and a reserve firefighter for 5 years prior to joining the harbor patrol. 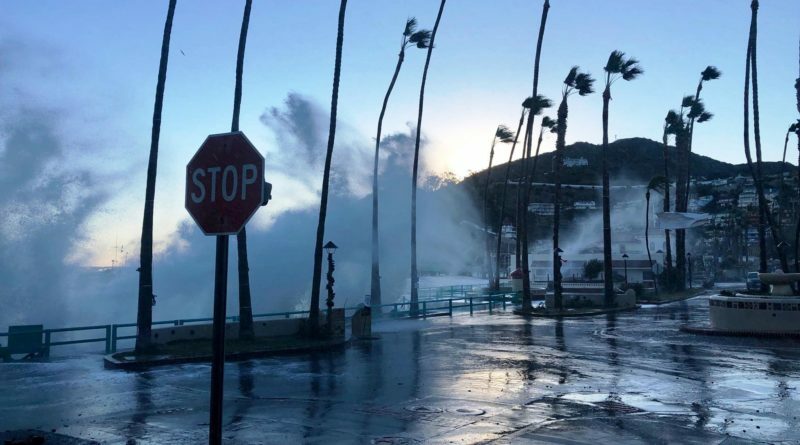 Sadly, his death served as an example of how dangerous waters can be during bad storm conditions on Catalina Island no matter how experienced one is with the sea. To make sure boaters safely navigated the storm, harbor patrol passed out flyers with weather warnings and referenced the storm of 2014. “Even though I’m sure some people had tickets for the ball [Avalon’s annual New Year’s Eve Ball], they got the impression that we [harbor patrol] were serious about this weather event. The storm hit about 6pm on the 31st [of Dec.] with a vengeance, and lasted for about 36 hours. The wind topped out at about 40kts with sustained winds of 30-35 knots and about 6-8 feet seas in the harbor throughout the night,” Poindexter continued. Poindexter is a big advocate of calling Avalon’s harbor department before departing from the Mainland to check in on the weather forecast. Boaters, he said, largely stayed away from the harbor even larger vessels. As witnessed by the events of 2014, being safe on the waters is not only important for boaters, experienced and not, but also for Catalina’s harbor patrol who are responsible for the safety of all moored in the harbor. Avalon Harbor Patrol can be reached at 310-510-0535 or by email at harborpatrol@cityofavalon.com.